I had these today for class. 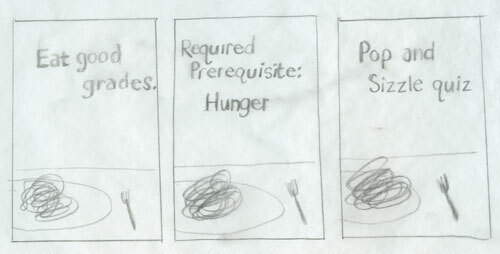 Some critiques: tweak headlines -> Eat our good grades. and Take the Pop and Sizzle Quiz. Make the image complement the headline and perhaps play with type to match a graded paper. I have a week to carry these as far as I can go. It’s time for some food photography!